بیگلری, معین, اصغر زاده, سید محمد, کاوسی, امیر. (1396). بررسی عوامل موثر بر چسبندگی بین لایه ی روسازی بتن غلتکی و میان لایه ی ماسه آسفالت جاذب تنش. فصلنامه علمی - پژوهشی مهندسی حمل و نقل, 9(ویژه نامه روسازی), 89-104. معین بیگلری; سید محمد اصغر زاده; امیر کاوسی. "بررسی عوامل موثر بر چسبندگی بین لایه ی روسازی بتن غلتکی و میان لایه ی ماسه آسفالت جاذب تنش". فصلنامه علمی - پژوهشی مهندسی حمل و نقل, 9, ویژه نامه روسازی, 1396, 89-104. بیگلری, معین, اصغر زاده, سید محمد, کاوسی, امیر. (1396). 'بررسی عوامل موثر بر چسبندگی بین لایه ی روسازی بتن غلتکی و میان لایه ی ماسه آسفالت جاذب تنش', فصلنامه علمی - پژوهشی مهندسی حمل و نقل, 9(ویژه نامه روسازی), pp. 89-104. بیگلری, معین, اصغر زاده, سید محمد, کاوسی, امیر. بررسی عوامل موثر بر چسبندگی بین لایه ی روسازی بتن غلتکی و میان لایه ی ماسه آسفالت جاذب تنش. فصلنامه علمی - پژوهشی مهندسی حمل و نقل, 1396; 9(ویژه نامه روسازی): 89-104. یکی از راهکارهای کاهش ترک­ها در روکش های آسفالتی استفاده از میان­لایه­های جاذب تنش است که مورد توجه پژوهشگران قرار گرفته است. اما در اجرای میان­لایه­های جاذب تنش نیز باید مواردی از جمله چسبندگی درست بین میان­لایه و لایه روسازی قدیمی رعایت گردد تا خرابی­های دیگری مانند ترک­های هلالی در روکش ایجاد نگردد و عمر روسازی جدید افزایش یابد. در این مقاله چسبندگی بین میان­لایه جاذب تنش ماسه آسفالت و لایه­ بتن غلتکی مورد بررسی قرار گرفت. به همین دلیل عواملی مانند نوع اندود سطحی، مقدار اندود سطحی مورد استفاده و دمای لایه­ زیرین که در اجرای میان لایه اهمیت دارند در این پژوهش مورد ارزیابی قرار گرفت. چهار نوع قیر متفاوت شامل قیر 70/60، قیر 70/60 اصلاح شده با پودر لاستیک، قیر امولسیونی CSS و قیر امولسیونی CRS به منظور تعیین قیر مناسب برای اندود سطحی انتخاب گردید و هرکدام به میزان 200، 400 و 600 گرم بر مترمربع بر روی سطح بتن غلتکی اجرا گردید. همچنین برای تعیین دمای مناسب پخش اندود سطحی، دمای لایه­ بتن غلتکی 0 و 25 و 60 درجه­ سانتی‌گراد در نظر گرفته شد. آزمایش مقاومت چسبندگی بین لایه­ای با استفاده از دستگاه ال پی دی اس و بر روی نمونه­های استوانه ای انجام گرفت. بر این اساس مشخص گردید که عواملی چون ویسکوزیته اندود سطحی و مدت زمان شکست قیر امولسیونی تاثیر زیادی بر روی میزان چسبندگی بین لایه­ای دارند. نتایج این آزمایش نشان داد که استفاده از قیر 70/60 و قیر 70/60 اصلاح شده با پودر لاستیک در دماهای بالاتر چسبندگی مناسب­تری ایجاد می کند در حالی که افزایش دمای روسازی برای قیرهای امولسیونی لزوما نتایج مطلوبی را در پی نخواهد داشت. همچنین در دماهای بسیار پایین سطح روسازی، استفاده از قیرهای امولسیونی با مقدار کمتر توصیه می گردد؛ در شرایطی که در این دما استفاده از قیرهای خالص و اصلاح شده با مقدار بالاتر موجب افزایش چسبندگی می­شود. -Asgharzadeh, S. M., Tabatabaee, N., Naderi, K. and Partl, M. (2013) “An empirical model for modified bituminous binder master curves”, Mater. Struc., Vol. 46, No. 9, pp. 1459-1471. -Asphalt Institute (2007) “The Asphalt Handbook MS-4”, Asphalt Institute, Lexington,KY. -Chen, J.-S. and Huang, C.-C. (2010)" Effect of surface characteristics on bonding properties of bituminous tack coat", Transportation Research Record: Journal of the Transportation Research Board, Vol. 2180, pp.142-149. -Cho, S. H. (2016) "Evaluation of interfacial stress distribution and bond strength between asphalt pavement layers", A dissertation submitted to the Graduate Faculty of North Carolina State University in partial fulfillment of the requirements for the Degree of Doctor of Philosophy, advisor: Dr. Y. Richard Kim North Carolina State University. -Collop, A., Sutanto, M., Airey, G. and Elliott, R. (2009) "Shear bond strength between asphalt layers for laboratory prepared samples and field cores" Construction and Building Materials, Vool 23, pp. 2251-2258. -Deysarkar, I. ( 2004). "Test set-up to determine quality of tack coat", A dissertation submitted to the Graduate Faculty of North Carolina State University in partial fulfillment of the requirements for the Degree of Doctor of Philosophy, University of Texas at El Paso. -Diakhate, M., Millien, A., Petit, C., Phelipot-Mardele, A. and Pouteau, B. (2011) "Experimental investigation of tack coat fatigue performance: Towards an improved lifetime assessment of pavement structure interfaces", Construction and Building Materials, Vol. 25, pp. 1123-1133. -Hachiya, Y., Umeno, S. and Sato, K. (1997) "Effect of tack coat on bonding characteristics at interface between asphalt concrete layers", Doboku Gakkai Ronbunshu, Vol. 1997, No. 572, pp.109-209. -Hasiba, K. I. Q. (2012) “ Development of a testing approach for tack coat application rate at pavement layer interfaces”, Thesis Submitted in Partial Fulfilment of the Requirement for the MSc Degree in highway and transportation engineering, University of Illinois at Urbana-Champaign. -King, G. and May, R. (2003) “New approaches to tack application”, Presentation made to the 83rd Annual Meeting of the Transportation Research Board, Washington, D.C.
-Leng, Z., Ozer, H., Al-qadi, I. and Carpenter, S. (2008) "Interface bonding between hot-mix asphalt and various Portland cement concrete surfaces, laboratory assessment”, Transportation Research Record: Journal of the Transportation Research Board, Vol. 2057, pp. 46-53. 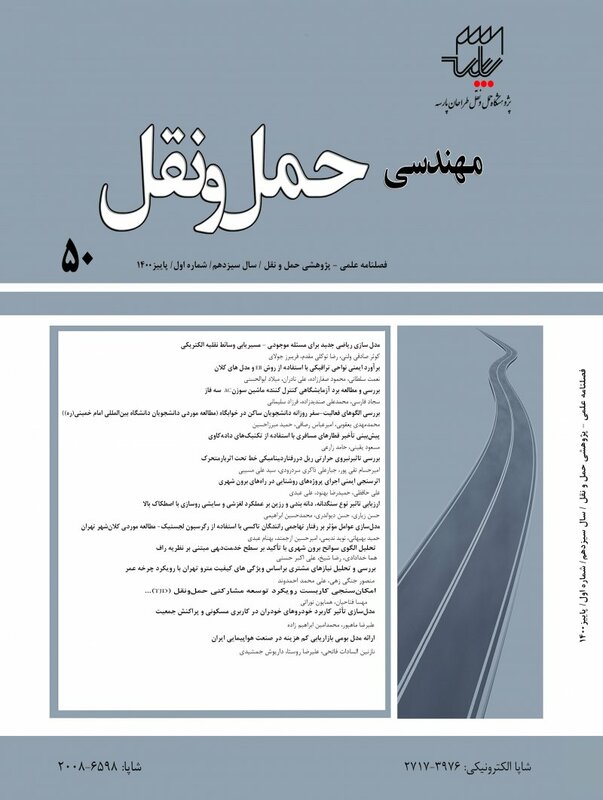 -Biglari, M. (2016) “Reflective cracking evaluation of SAMI application”, Thesis submitted in partial fulfilment of the requirement for the degree of master of science (M.Sc) in Highway and Transportation Engineering, Supervisor:Dr. Seyed Mohammad Asgharzadeh, Tarbiat Modares University. -Mohammad, L. N. (2012) " Optimization of tack coat for HMA placement", Transportation Research Board, NCHRP, Report 712. -Mohammad, L., Raqib, M. and Huang, B. (2002) "Influence of asphalt tack coat materials on interface shear strength", Transportation Research Record: Journal of the Transportation Research Board, Vol. 1789, pp. 56-65. -NCDOT - North Carolina Department of Transportation (2012) “Standard specifications for roads and structures”, NCDOT, Raleigh, NC. -Nguyen, N. L., Van Dong, D. A. O., Nguyen, M. L. and Huu, D. (2016) "Investigation of bond between asphalt layers in flexible pavement" , 8th. Rilem International Conference on Mechanisms of Cracking and Debonding in Pavements, Nantes, France. -NLT-328/08 2008 "Evaluation of the adhesion between asphalt layers, through shear test [Evaluacuón de la adherencia entre capas de firme, mediante ensayo de corte]", 1ª edn, CEDEX Spanish Standard, Madrid. -Paul, H. and Scherocman, J. (1998)" Friction testing of tack coat surfaces", Transportation Research Record: Journal of the Transportation Research Board,Vol. 1616, pp. 6-12. -Raposeiras, A. C., Vega-Zamanillo, Á., Calzada-Perez, M. Á. and Castro-Fresno, D. (2012) "Influence of surface macro-texture and binder dosage on the adhesion between bituminous pavement layers", Construction and Building Materials, Vol. 28, pp. 187-192. -Raposeiras, A., Castro-Fresno, D., Vega-Zamanillo, A. and Rodriguez-Hernandez, J. (2013) "Test methods and influential factors for analysis of bonding between bituminous pavement layers", Construction and Building Materials, Vol. 43, pp. 372-381. -Roffe, J.-C. and Chaignon, F. (2002) "Characterisation tests on bond coats: worldwide study, impact, tests, recommendations", Proceedings Of The 3rd International Conference on Bituminous Mixtures And Pavements, Held Thessaloniki, Greece. -Tayebali, A. A., Rahman, M. S., Kulkarni, M. B. and Xu, Q. (2004) “A mechanistic approach to evaluate contribution of prime and tack coat in composite asphalt pavements”, North Carolina Department of Transportation. -Tozzo, C. Fiore, N. and D’andrea, A. (2014) "Dynamic shear tests for the evaluation of the effect of the normal load on the interface fatigue resistance", Construction and Building Materials, Vol. 61, pp. 200-205. -Uzan, J., Livneh, M. and Eshed, Y. (1978)" Investigation of adhesion properties between asphaltic-concrete layers", Association of Asphalt Paving Technologists Proc, Vol. 47, pp. 495-521. -West, R. C., Zhang, J. and Moore, J. (2005) "Evaluation of bond strength between pavement layers", NCAT report, 05-08.